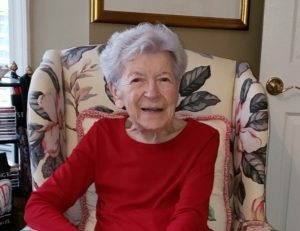 Virginia Lee Marchand, 88, of Greer, widow of the late Leo Marchand, passed away peacefully at home on April 9, 2019 surrounded by her family. Born in Huntington, WV, she was the daughter of the late William Joseph Gerlach and the late Marian Ruth Edelman Gerlach. Virginia was a lifelong educator and musician. Virginia is survived by three daughters, Catherine Spencer of Charleston, SC, Mary Evans and her husband, Ronald, of Catlettsburg, KY, and Lisa Saunders and her husband, Terri, of Lexington, KY; two granddaughters, Marian Turner and Rachel Saunders; a great-granddaughter, Amelia Rose Turner; a sister, Patricia Tatem; nephews Richard and Jeff Tatem and William Woods, and niece Michelle Woods. In addition to her husband and parents, Virginia was preceded in death by a sister, Rose Chapman. A Funeral Mass will be held on Friday, April 12, 2019 at St Anthony of Padua Catholic Church beginning at 11:00 am. The church is located at 307 Gower Street, Greenville, SC 29611. Friends and family are welcome at the home after the service. In lieu of flowers, donations may be made in her honor to the Cancer Survivor’s Park of Greenville 24 Cleveland Street, Greenville, SC 29601 or the Guild of the Greenville Symphony, 225 South Pleasantburg Drive, Suite B11-1, Greenville, SC 29607. Catherine, I know you’ll miss your times together. Sending peace to you and your family. What a beautiful woman she must have been; I am sorry for your loss and grateful for the wonderful life you shared with her. Catherine: I so admire you and your sisters for being there with your Mom as she slipped from this life to her next great adventure. Find a way to stay close, and never forget the things you’ve had in common in your early lives together. My love is with you especially, and with your sisters.